Tuft & Needle is one of the newer mattress manufacturers in the industry and they’ve quickly gained a reputation for creating innovative memory foam mattresses that are priced affordably, yet still comparable in quality to higher priced models. The Tuft & Needle memory foam mattress is one of their most popular models and the best mattress for back sleepers. This bed features two layers of memory foam, offering a total thickness of ten inches, which is pretty impressive. This mattress passed every test we threw at it and still managed to take the lead as one of the most comfortable mattresses on the market. The bed’s top layer measures in at three inches of poly foam. This layer provides cooling, comfort, and support. The foundational layer of the mattress measures in at seven inches and creates a thick layer of support, while also providing the shape. The thin mattress cover improves the material’s cooling abilities, compared to traditional quilted mattress covers. When it comes to support, this mattress is very firm, which is what makes it a great choice for back sleepers. Consumers describe the firmness as medium, which also makes it a suitable choice for side sleepers. The feel of the foam is somewhere between memory foam and latex. While the mattress response isn’t instant, it’s not exactly slow like memory foam either. The contour isn’t very pronounced, but it’s also not floating. The foam and design are both fairly simple, which is what helps to keep the price down. We feel that the bed should offer more of a latex feel, which would help to improve the overall bounciness, however, we’re also fans of traditional memory foam and the manufacturer has done a nice job of offering up this hybrid of sorts. 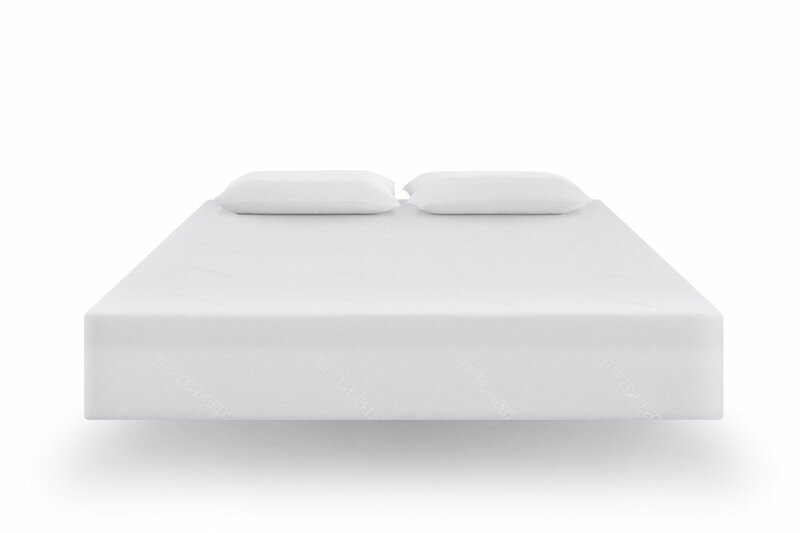 The manufacturer combines an airflow system and high-density, high-quality polyurethane foam that offers both the advantages of latex and memory foam, but at the fraction of the price. Just like memory foam, this type of foam is designed to provide support to the spine, helping to prevent both neck and back pain. It also eliminates the common problem of heat-trapping that memory foam is known for. This material also aims to offer more support than standard memory foam thanks to the thick top layer. This type of foam provides great weight distribution, universal firmness, and a more localized bounce. While the type of motion isolation you can expect from this foam isn’t quite as impressive as what you’ll get with memory foam or a higher end latex mattress, consumers who purchased this model by Tuft & Needle noted that their movements did not affect their partner. This model is designed with localized bounce. Localized bounce means that people can sleep on the same mattress without disturbing each other during the night when changing their sleep position. A bed that’s designed to allow you to sleep cool, the bed is equipped with a special surface treatment found on the bottom, designed for increased air flow. As you sleep, the mattress works to draw heat away from the body, successfully eliminating it through both layers. Pros: A pure foam mattress is typically made of several layers, each with different foam densities that help to attain a certain type of firmness. But the downside to this design is that with every layer there must be a layer of glue used to keep each of the layers snuggly attached. So while the foam itself may be highly breathable, the added adhesive works as a type of barrier. This means, the more layers there are, the stronger the glue barrier becomes, which results in poor airflow, causing heat to easily become trapped throughout the night. To bypass this issue, the manufacturer came up with a simple solution and used just two layers. As a result, the amount of airflow is vastly superior compared to competing models. Polyfoam mattresses that are made from higher density foam will typically have a longer lifespan than low-density models. The foam that’s used in the support and comfort layers of this bed features a structure that’s very close to latex. Potentially, this mattress can last for a period of ten years. Usually, poly foam emits a type of chemical smell when it comes from the factory, because of the VOCs that are released after and during the manufacturing process. However, there have been no complaints from consumers regarding this type of smell, which is pretty impressive. In any case, if you happen to notice this type of chemical smell when your mattress arrives, allow it to air out for a period of forty-eight hours. This mattress is covered by a ten-year warranty against material defects. The warranty also covers any visible sag when there is no weight placed on the mattress. You’ll also enjoy a hundred day sleep trial. During this time, if you find that the bed just doesn’t meet your unique sleep needs, you can return it for a full refund, no questions asked. Because this bed offers the perfect amount of back support, it’s a model that’s highly recommended for pregnant women. Adding the Leachco pregnancy pillow to this setup can be the perfect combination for ultimate comfort during pregnancy. Cons: In order to get the best sleep possible using this mattress, it must be used with a firm foundation. The mattress itself is very firm during the first few months of use but will soften to a medium firmness over time. A bed that’s breathable and cool, just like latex, but equipped with motion isolation and the type of firmness that memory foam offers, this popular model is one of Tuft & Needle’s top sellers. Consumers who purchased this bed for back sleepers gave it a rating of five out of five stars for quality, pricing, and breathability.